Although bringing some changes, 2018-19 Upper Deck Ice Hockey is still a set defined by acetate designs and some really limited rookie cards. Also worth noting, every autograph in the NHL release is hard-signed. Slightly increasing the pack size compared to 2017-18, each box averages one autograph, one memorabilia card or Exquisite Collection card, and a pair of Ice Premieres cards. 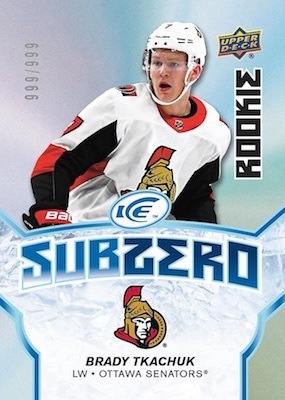 Speaking of the Ice Premieres cards, collectors can again look forward to tiered levels of rarity for the rookie cards. These add to the smaller main set, which checks in at 150 cards overall, including 50 base cards. The base cards in 2018-19 Upper Deck Ice Hockey have Green (1:1), Red (#/5) and Black (1/1) versions, while the Ice Premieres cards offer just the one-of-one Black parallel. 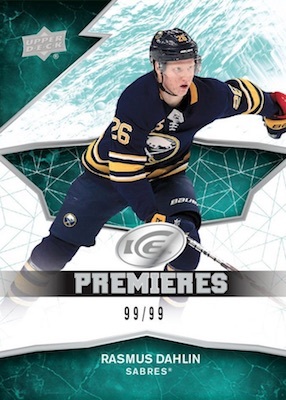 There are also Ice Premieres Retro (#/149) cards. 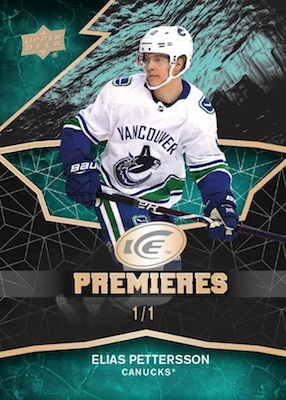 Building on the non-hit selection, 2018-19 Upper Deck Ice Hockey inserts include SubZero chase cards. SubZero features stars (1:12) and rookie subjects (#/999). The SubZero set also has Gold parallels (#/24 or #/8) and Rookie Variants (1:240). 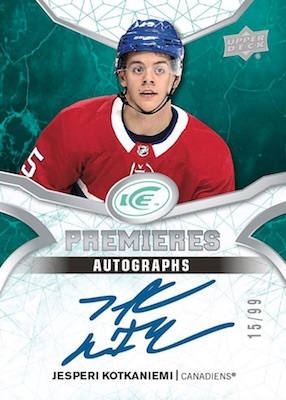 Supplying more of the on-card signatures, 2018-19 Upper Deck Ice Hockey provides multiple autograph inserts. The lineup includes Glacial Graphs (1:140), Glacial Prime Graphs Autograph Jersey Black, Rinkside Signings (1:180), Superb Script (#/49 or #/25), and Superb Script Portraits (#/15 or #/10). 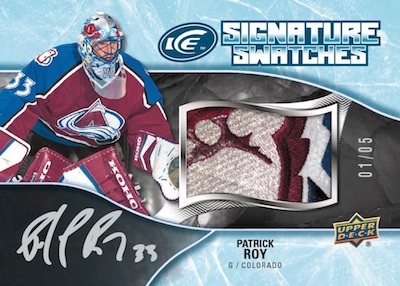 At 1:120 packs, Signature Swatches cards combine a large jersey piece with an autograph. Clear Cut Champions cards are specifically for the 2018 Stanley Cup-winning Washington Capitals players. There are also memorabilia hits via Frozen Foursomes (1:240) and Rookie Relic Jumbos (#/199). 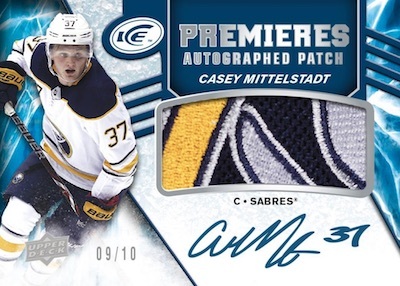 Additional hit options falling under the primary Ice Premieres line are the Ice Premieres Autographs (#/299, #/199 or #/99), Ice Premieres Autographed Patch (#/10), and Ice Premieres Jersey (1:12) cards. Signed SubZero choices include new SubZero Stars Auto Blue (1:150), SubZero Rookies Auto Blue (1:60) and SubZero Rookies Variant Green Autograph (#/25) cards. 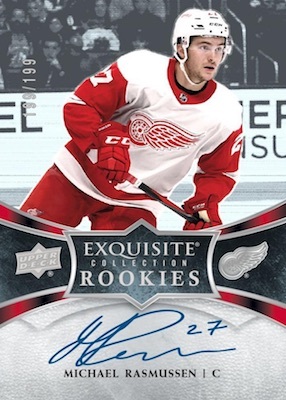 Combining with the relics to average one per box, the second round of 2018-19 Exquisite Collection Hockey comes in 2018-19 Upper Deck Ice Hockey. Part one was in 2018-19 UD Black Diamond. Collectors can chase Exquisite Signatures, Exquisite Material Signatures, Exquisite Platinum Rookies Signatures (#/199 or #/99), and 2004-05 Exquisite Rookie Auto Patch Tribute (#/25) cards from the set-within-a-set. Unsigned Exquisite Platinum Rookies cards are numbered to 299 or 199.